I made my first quick visit to Revolution Brewing Co back in March of 2010 shortly after the opening. That was when you could just walk in and grab a table. Now the world knows about Revolution and the great vibe and beer (just won a few Gold Medals) and getting a table is far more complicated. Luckily I went on a weeknight and it was just Anne and me. First and foremost the beer is extremely good and could be my favorite of the city brewpubs (though Piece is also fantastic). The space is really cool too with a fireplace, a long double sided bar and a wood fire pizza oven in the back. There's also a small section of seating on a second level "loft" area over looking the bar. It's not a huge space but there's plenty of room to pack in the people. I also love the detail put into the bar with their fist logo used in wooden columns. The menu is pretty standard modern bar food with sandwiches, pizzas, starters and few entrees/salads. It's a nice balance of small plate bar finger food or make a meal out of any combination of larger plates. Anne let/made me order so I went with one pizza (Arugula), one sandwich (pulled pork) and a starter (black bean mole lettuce wraps). 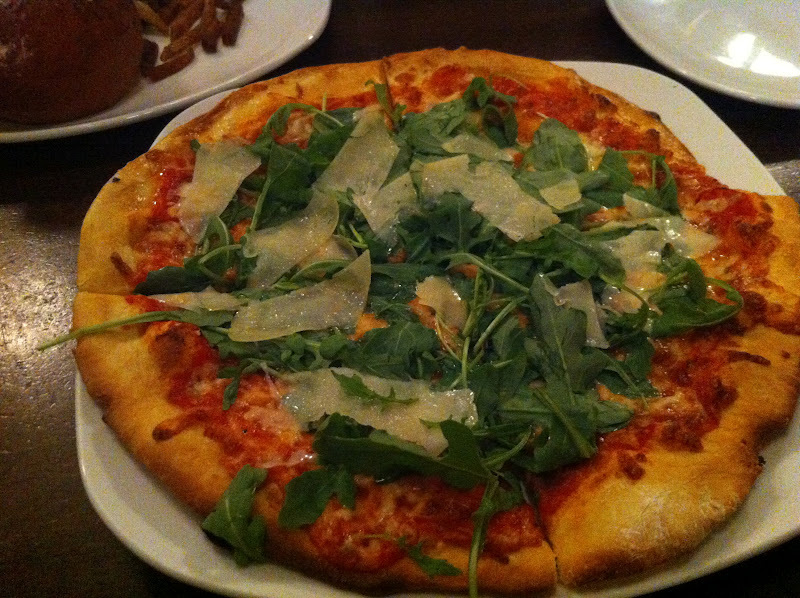 The pizza was good but nothing special and I was disappointing the crust was not crisp at all, more soggy/doughy. 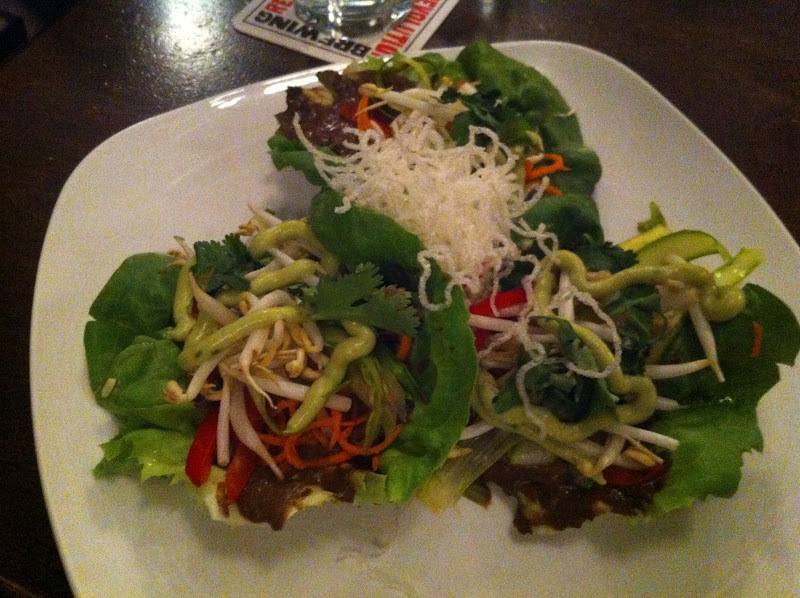 The lettuce wrap was a complete failure and I question what I was thinking ordering it in the first place. The mole was a black paste that had a strange consistency and everything else in the wrap didn't add anything to the mess. Oh well. 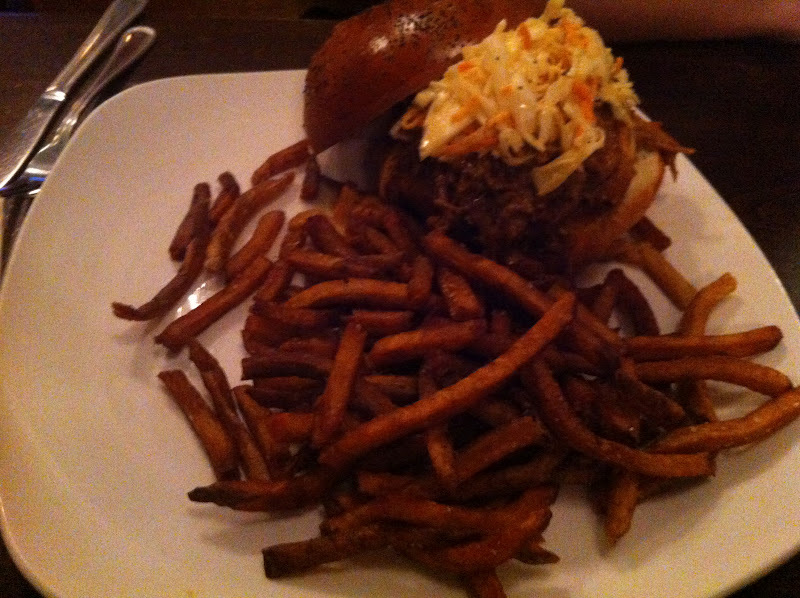 The sandwich was good and large - a pretty standard pulled pork creation. It needed more sauce and I didn't have the energy/courage to ask for more. The fries were also tasty. Revolution is a place I want to love. The beer is great, the space is interesting and the service is attentive. I think the food selection I had was mediocre and I don't know if that was just one night or not. The value is a bit strange and seemed expensive ($10 sandwich, $12 pizza, $11 starter + beer) though the individual items don't seem high (maybe all the beer pushed the check up). My advice: try a lot of beer, get a sandwich/burger and/or a lot of finger food. The pizzas are probably hit and miss but with a solid crowd, good beer and interesting food, it's worth checking out (and I should return for a second chance). Cheers to a Revolution.